As we reported earlier Lufthansa, Europe’s largest airline has begun scheduled flights to Ibrahim Nasir International Airport directly from Frankfurt on Thursday, December 10th. 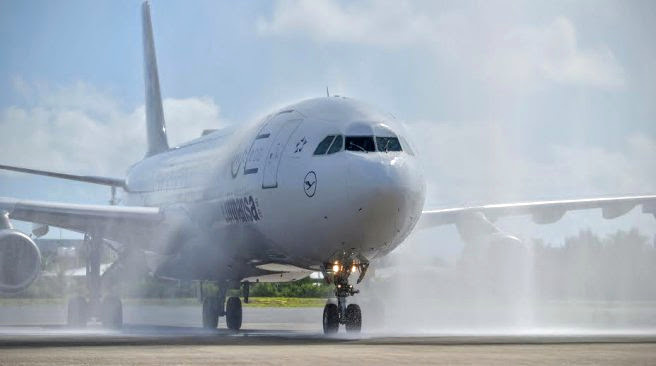 The flight which landed at 9:30 am local time on Thursday was greeted with the traditional water salute on the taxiway and with Bodu Beru (traditional drum) performance. The Minister of Tourism Moosa Zameer honored the inaugural flight landing ceremony, along with Wolfgang Will, the director of South Asia, Lufthansa Passenger Airlines. The airline has four weekly Frankfurt – capital Malé scheduled flights every Wednesday, Thursday, Saturday and Sunday, operated on the Airbus A340-300 with a passenger capacity of 298. 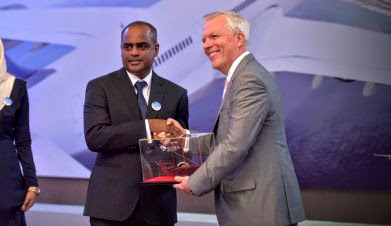 Wolfgang Will, the director of South Asia, Lufthansa Passenger Airlines, commented on the Maldives’ booming tourism at the ceremony, expressing hopes that Lufthansa’s new flights will be a boost to the country’s progress. “The introduction of the new direct flight to Malé clearly demonstrates the importance of this market segment for Lufthansa and underlines our commitment to provide our customers with consistent and the best Lufthansa experience worldwide,” he said. Lufthansa has tailor-made these flights to suit private travellers, which has paid off: the inaugural flights were very well booked and the advance bookings for the upcoming Christmas and holiday weeks are looking very good. 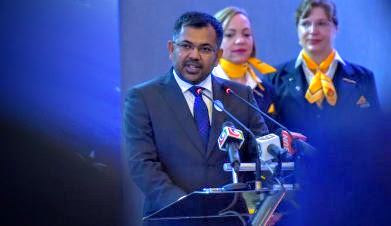 Malé is one of the several new holiday destinations Lufthansa has added to its network in the last few months. The aircraft used for these flights, equipped with a FlyNet broadband connection, is the Airbus A340-300, with seats spread over three different travel classes. Out of a total of 298 seats, 18 are in Business Class, 19 in Premium Economy and 261 in Economy.